If you look closely at the reflection in the window of the rendering, you'll note that it's a big building, although none currently exist on the spot from where the reflection would be coming. (Wishful thinking? Intelligent guess?) Also, note the presence in the rendering of people in jackets and ties at Third Avenue and Sixth Street. 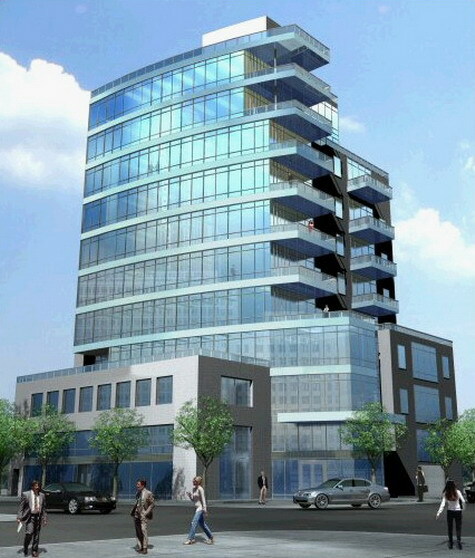 The developer of the Glass Tower of Gowanus is Dominic Tonnachio. If the name is familiar, that is because he is the developer of the new Hotel Le Bleu as well as a condo on Fourth Avenue and Warren Street. Demolition permits have been issued for the existing property, which has one small building, but the plans for the new building were disapproved on Aug. 14 by the Dept. of Buildings. We suspect it's only a temporary setback. The good news: the views of the Gowanus, the F Train and Whole Foods--especially of the parade of trucks delivering and unloading food--should be dramatic. I find the absence of any non-white people in this rendering very telling. I'm not sure of that. The woman center stage looks black (I'm presuming some sort of head wrap) and the gentleman to the far left looks rather swarthy. If this building will make 3rd Ave look like this, I'm all for it. you people need to move back to your parents trailer in ohio. new york is about change. live here ten years and you'll realize this. it's what defines nyc. change.